2014 marks the first year I'm on pace to max out my Roth TSP and Roth IRAs. For the Thrift Savings Plan, I setup automatic deposits on myPay at $1458 per month, which will result in $17,496 invested over the course of 12 months ($4 short of the maximum $17,500 contribution). For my Roth IRAs, Vanguard offers an excellent “maximum my contribution” service which calculates exactly how much you'll need to contribute each paycheck to maximum your Roth IRA contributions by years end. If you do the math, it should come out to about $230 per paycheck per Roth IRA account. So to maximize both my wife's and my own account, it's about $460/paycheck. This withdraws automatically from my checking account on the 1st and 15th. Because of these contributions, as well as starting to invest in a taxable investment account, I find myself with a sizable retirement investment which I recently reallocated in accordance with my investment strategy. I'm using Personal Capital to keep track of my Roth TSP, two Roth IRAs (my wife's and my own), my taxable brokerage account, and my SDP account. It's free and easy to keep track of all my investments so I only need to login once, instead of on to multiple websites. 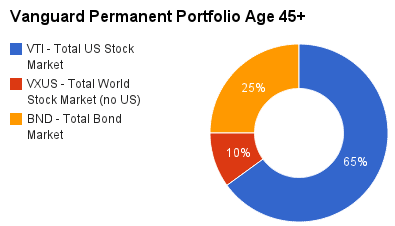 My permanent portfolio will be a 75% stock, 25% bond mix, which I will reach at age 45. After that, I'll just rebalance my portfolio annually or if the allocation gets off by more than 5% to maintain the 75-25 stock-bond mix. This is a bit more aggressive than what many financial advisors recommend (60-40 stock-bond seems to be the norm). But, because the majority of my investments will be locked in the TSP and Roth IRA accounts, I won't be able to touch most of my investments until 20 years after financial independence. Therefore, I'll stay more risky to give the capital the opportunity to grow. While I haven't had to stomach a major economic downturn yet, I'm confident in my ability to remain calm during another market collapse like 2008. I'll see if I can still say that when I lose hundreds of thousands of dollars. Here's the same permanent portfolio, one in TSP Funds, the other in Vanguard ETFs. I like Vanguard Admiral shares for their low expense ratios, but the ETFs have easier to remember ticker symbols. Both the ETFs and the Admiral Shares contain the same assets. I currently have both my wife's and my Roth IRA accounts with Vanguard, as well as our taxable brokerage account. It's the same 75% stocks, 25% bonds mix. You have to get a little creative in the TSP to match the VTI Vanguard Total Stock Market Index Fund, but if you want to match it just hold 4x the amount of C Fund as you do of S Fund. This will mirror the VTI fund almost perfectly. There are several things I like about this asset allocation. It's simple. Only three Vanguard Admiral Share Funds to invest in. TSP makes interfund rebalancing easy and automatic contribution investment easy. Rebalancing takes 15 minutes a year. I don't try to time the market or pick winning stocks. I just let the market work for me. It's diversified. I own shares in the 5000 largest publicly traded companies in the US. I own shares in Canada, Europe, Asia, emerging markets, all over the world. My bond funds cover the full spectrum of government and corporate debt. I have a portion of my portfolio in the G fund, a unique US government debt asset. It's cheap. The TSP expense ratios are 0.027%, or $2.70 per year for every $10,000 invested. The three Vanguard Admiral Shares average at 0.09%, or $9 per year for every $10,000 invested. With these extremely low expense ratios, even a modest return is put into your pocket, rather than your fund managers'. See Vanguard's research on why keeping costs low matters. It's automatic. My investments happen every month, without any action on my part. myPay whisks the money from my paycheck into the TSP and Vanguard plucks it out of my checking account before I even notice it's there. No exposure to real estate. I prefer my real estate to be tangible. I don't like REITs (Real Estate Investment Trusts) and would prefer to invest in real estate by buying property and turning it into AirBnB. The most important part of any asset allocation or investment plan is to stick with it for the long haul. Constantly trading in and out of stocks, chasing performance, or going after whatever the latest investment fad is fine for maybe 1-5% of your portfolio, but the majority of your retirement savings must be invested prudently and wisely. Fear is also a major killer of portfolios. Selling too early, selling at the bottom, or buying high can kill your performance and savings. Better to invest methodically, with an eye on the very long term, and ignore CNBC and the daily market news. Don't try and time the market. How about you, reader? What is your investment strategy, especially if you serve in the military? Have you thought about an asset allocation plan and how to follow it? Any problems you see with my portfolio? 1) BND is composed of 58% US already. 2) G Fund has outperformed BND over the history of the ETF and has lower expense ratios. 3) G Fund is completely risk free. Glad to see you’re maxing out your IRA. I like your asset allocation but think it may be a little heavy on the bond side that early. I personally like to see moving assets towards bonds within 10 years of retirement. But as always different strokes for different folks. I do like the funds that Vanguard offers, great management team over there! I like having the bond exposure in case another 2008 happens. Then I’ll have the money to take advantage of the crash. My husband and I have a similar allocation to yours, but I’m still trying to get our system simplified. 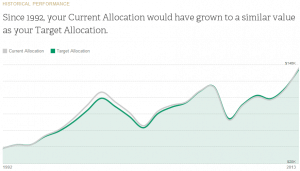 I haven’t figured out yet if each account (his TSP, my 401(k), our IRAs, and a brokerage account) should have the allocation I want, or if I should just care about the allocation of the entire portfolio. I end up having to rebalance every quarter, and it’s quite a bit of work to consolidate all the data and figure out where to make changes. Bethany – you should have your entire portfolio allocated according to your asset allocation plan. That means either hold the same percentages in each account or hold the correct percentages across all your accounts (requires more math). For instance, you could hold all your bonds in the TSP (because of the access to G Fund) or just hold bonds in all your accounts. Up to you, but look into tax efficient investing. The bogleheads wiki would be a good place to start researching. Thanks for the tip on the bogleheads page. I’ll be checking it out. I’m definitely using the “more math” system right now. It gets complicated, but that’s what Excel is for. why are you under contributing to the Roth TSP (even if it is only $4)? You can always divide by 12 so it comes out over the $17,500, which will automatically reduce on the last pay check to $17,500 or if you have been in combat exclusion zone, will allow the amount to exceed $17,500. My husband maxed his Roth TSP last year. His December contribution was automatically reduced and then went back to the designated percentage in January. If the Air Force is as on top of it as the Marine Corps, you should be good. Great article, I thoroughly enjoyed reading it, but I thought I would ask why you have your Roth TSP diversification mirroring your Vanguard Roth IRA…not knocking it, just wondering why you have the two so similar. I thought about investing in that particular fund (just like you, in the Admiral Shares) but I found that they weren’t necessarily performing as well as some other funds, and when I calculated it’s return – inflation, I was only getting about a 6.9-7% return…which is good, don’t get me wrong, but hasn’t outpaced it’s benchmark (CSRP). Could you explain what your philosophy is on risk aversion? Great site, I just thought I would spark a little conversation. not speaking for Spence…ok, I am, since I’m extrapolating, but it seems clear he is keeping it simple and wants to keep his overall portfolio balanced along indexes. If you go with other sector specific or growth, income, large cap, small cap, or whatever, then you have to broaden your portfolio to include the other stuff in order to have a balanced portfolio. History has shown sticking with index outperforms or equally performs everything else. Exactly right, Tim. I like keeping my portfolio simple and balanced. And, like you said, indexing outperforms over 80% of actively managed funds over a long enough time horizon. Spencer — great post here. I’d echo the sentiments put forth by Chad regarding the “Gap fund.” Specifically, for this post-retirement to 59.5, what types of investments, how much, etc.? I’m an avid follower of this blog and enjoy the articles! I recently commissioned into the USAF, and plan to take a similar approach when it comes to personal finance as my career progresses in the years to come. Thanks and keep up the great blogging! Hey Sean, thanks for the comment. Glad I caught you early in your Air Force career! Now is the best time to start saving, investing, and setting yourself up for financial independence. I posted a reply to Chad, I’ll be doing a more detailed analysis of my gap fund in a future post. As always, it’s better to save, invest, and have the assets to make the right moves than be paralyzed by over-analysis. Every year you miss contributing the maximum amount into your tax advantaged retirement accounts (Roth TSP and Roth IRA) are years you cannot get back. Spencer, thanks for the in-depth article and for the website as a whole. I’m in a very similar situation to you (maybe a year or two further in my AF career) so I appreciate the very relevant, detailed, and military-specific points you make. Overall, nothing but great things to say for your work. In fact, it has inspired me to start thinking I may be able to do something similar if I commit to it. To that end, I’d like to learn more about your ‘Gap Fund’. You’ll have about 20 years between your financial freedom goal age and the time you can tap into the accounts discussed above. How much will you need to cover this timeframe? What are you investing in for this? If you’re not planning on the military retirement, are you anticipating any additional income streams i.e. rental properties? I’m curious about it because you’ll need to rely on it much earlier than the tax-advantaged accounts, withdraw from it for 20 years, and you have only 15 years or so to accumulate enough to cover all this–a tall order. But, I’d like to do the same thing! Look forward to your response. Chad, thanks for the comment, glad I can add some value to the military-financial discussion. If I can inspire just one person to attaining financial independence/early retirement, then this website will have served it’s purpose. So the gap fund is an interesting discussion, one which I’ll have to write a full post to fully flesh out what I’m thinking about it. My basic thoughts are that your “gap fund” portfolio should be invested the same as the rest of your portfolio, with 2-3 years of cash or cash like assets on hand (CDs). See how Doug Nordman weathered the 2008 crisis. With a 3% safe withdrawal rate, your portfolio can weather any storm the markets can throw at it (see FIREcalc). However, even though your total portfolio is enough to retire on using the safe withdrawal rate, chances are your tax advantaged accounts will have the majority of your investments. You could potentially deplete your taxable investment account if you have a string of bad investment years or retire in the middle of a 2009 or 2000 bear market. I’ll address these concerns in a future post. I save 34% of my monthly E-3 pay between a savings account, investments, and the TSP. My investments are 100% in stocks. For the TSP, I’m 50/50 between the S- and C-fund. For my outside investments, I have 80% in US stocks and the remaining 20% in foreign stocks. I wish I could put away more but 1/3 of my pay is deducted and a majority of the other 1/3 is spent on bills. On average I have about $150 left over to play with. John – that is awesome! You are crushing those savings as an E-3! 100% stocks can definitely work for anyone 20+ years away from retirement. I like having a bit in bonds in case another crash happens. Then I can move some of my bond money into stocks and take advantage of the buying opportunity. Just some food for thought for you. How much have you saved up as an E3? And don’t worry too much about putting more away until you promote. You’ll get to 50% contribution one day for sure! I’m counting on (mostly) my military pension and whatever comes next to get me through that 59 1/2 to death period of time, which is why I have (mostly) neglected TSP. The tricky part for us in the military is that post-military retirement to 59 1/2 period of time. Well, that’s my biggest focus right now. I’ll be interested to see what you come up with, Mike, for those post-military-59.5 years. The military pension will be nice to rely on while you figure out those years. I’m not sure I’m going to make it 20, but hopefully they’ll offer a 15 year early retirement again when I get to that point! Yeah, those years are still a mystery to me. Once I get done with my current goals and I’m back to teaching, I’m going to focus on figuring it out. Right now, we’re still considering any number of things– from starting a business, to working freelance, to more traditional careers, to shooting for something that is high-earning that I’ll just do from 45-55 and then do another transition. Heck, maybe a combination of a few things. Best of all, the contributions are in autopilot and you don’t have to keep making decisions about it. 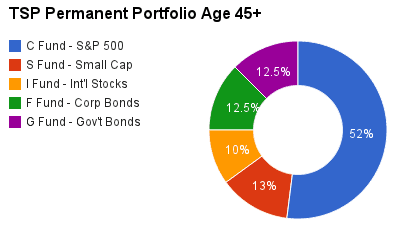 Every year in retirement I trade less, so I think you’ve given yourself a very low-maintenance portfolio. I love low-maintenance anything: cars, portfolios, computers. Life is so much better when stuff just works!